The star, 38, said it was "legacy time" and he was going to put on a tour of "great magnitude while I still can". He said he had been "lethargic" with his last couple of albums but the birth of his daughter and his reunion with Take That had re-invigorated him. "The rumours are true. I'm getting Robbie Williams back together again", the Angels star joked. The tour - his first full tour for more than six years - kicks off in Manchester next June before travelling to Glasgow and London's Wembley Stadium. X Factor star Olly Murs will be supporting Robbie on the 15-date tour. 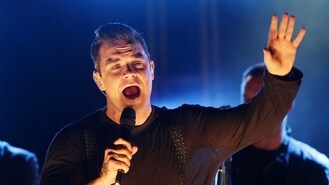 Speaking at a press conference in a London hotel, Robbie said: "I'm buzzing. I'm ready to go. I haven't done a tour of this size since 2006. "I believe that I'm at the place in my career where it's time to put my foot down and go 'This is what I do'. It's legacy time for me. "I'm getting my handicap down in golf and all that business. I'm nearly 40, that's what I'm trying to say. I don't know how many times I will get given this opportunity... I want to go and seal my place in pop history." He said he wanted to do a tour "of great magnitude while I still can" and "while people are still interested in seeing it".